Enough With The Ant Crap! Courtesy of Brother Hrab, check out the Bush Eye Chart. Courtesy of Cousin Ajay, check out this. You’ll need sound. Oh yes you will. And, courtesy of regular Deonandia visitor M., comes this blog from Beirut. 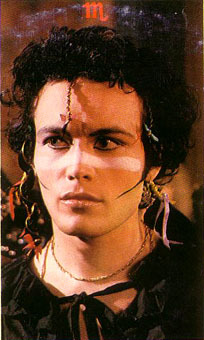 This continues to be Adam Ant week here on Deonandia. In honour of Herr Ant, I give you this satirical short film about the Antz shopping in a grocery store, called “Ant Muzak”. Apparently the lead, actor Nick Moran, looks so much like Adam Ant that Adam’s mother thought it was actually her son, somehow grown 20 years younger. If you’re as curious as I am about Mr Ant’s rise and fall, I think you’ll enjoy this excerpt from his upcoming autobiography. He’s actually a pretty good writer. And if that did the job for you, you might also enjoy this anecdote about how Adam gave Michael Jackson fashion advice. Thus ends my brief voyage into the biography of Squire Adam Ant…. or does it?